This is a nicely done $1K style solar domestic water heating system built by Matt in Pennsylvania. 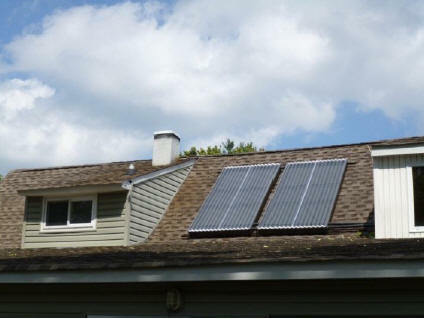 Matt's two copper/aluminum collectors on the roof. 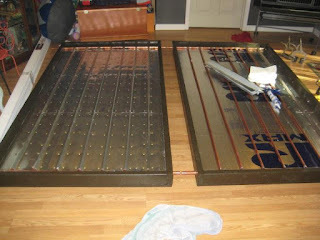 The system uses two homemade collectors in which the absorber is made from copper tube risers with black aluminium fins to transfer heat into the riser tubes. The collector is glazed with polycarbonate sunspace glazing, which holds up well to high temperatures harsh weather. These are relatively easy to build and all the materials are available at the local hardware. Laying out the collectors in the living room - not generally a spouse approved method. 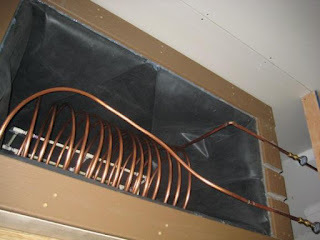 One of the unique features of Matt's build is the use of a copper pipe coil for the heat exchanger. Most of the $1K designs have used a coil of PEX for this purpose. This heat exchanger is used to heat the incoming cold water in a single pass before it goes to the regular hot water heater. Since it only gets the single pass to do the heating, it has to be an efficient heat exchanger. The copper coil appears to be doing well -- more of the details on that will be added when Matt finishes some tests he is running. The coil of copper heat exchanger inside the 250 gallon heat storage tank. New Home Page with "Web Walk"